Government is under attack in much of the country. In part, this is because many perceive government as having difficulty delivering on promised services at a reasonable price. As a result, voters are increasingly hesitant to approve new funding sources. San Francisco, like other cities, will have trouble raising additional revenue unless it shows that government can deliver. Ultimately, delivery of services is what the public wants, and the reason a large public workforce exists. Is government capable of delivering these services effectively and efficiently? Proving the answer to this question is “yes” is integral to preserving a prominent role for government in urban America. City government is little more than the people who work for it, and we can only expect to have an effective public sector if its workforce is well managed. But San Francisco’s employees and managers work within a system that often fails to take full advantage of their ability, fails to enhance their skills through training, and fails to recognize and reward their contributions. One major reason for these failures is the City’s antiquated and overly complex personnel and labormanagement systems. The concept underlying the creation of civil service systems beginning in the late 1800s—that hiring should be based on competence rather than political affiliation or other personal characteristics—still resonates strongly with most Americans today. But in cities across the country, there is a growing perception that civil service systems have hindered the ability of government to deliver services effectively. This is not entirely surprising. Government today is much larger than it was at the turn of the century when civil service systems were first established, and it is called upon to perform more sophisticated tasks. In addition, the relatively new arrival of collective bargaining has added another layer to public human resources, requiring governments to integrate these two often fundamentally different systems. This paper focuses on the rules, regulations and structure of the City’s systems for dealing with its employees—among other things, their recruitment, testing, hiring, training, evaluation, promotion, and governance. We do not address the age-old question of whether City workers are underpaid or overpaid, or the content of collective bargaining agreements themselves. Rather, we ask, what can the City do better in order to deliver the most services to the public with the dollars available? Achieving efficiencies requires a fundamental rethinking of the rules, structure and practices of our government, most of which date from an era when efficiency was a lesser concern. It also requires that we look at the system from the employees’ point of view. What is it about government personnel systems that takes eager, idealistic employees and proceeds to frustrate their efforts at every turn? How can a personnel system provide the incentives, psychic and tangible, for employees to remain enthusiastic about their jobs? 1. Transfer rulemaking authority from the Civil Service Commission to DHR director. 2. Redefine the primary mission of the Civil Service Commission to act as a merit appeals board with true appellate functions regarding employee selection, discipline and dismissals. • Require that rule changes, when applicable to a group of employees represented by more than one of the City’s 48 unions, be discussed at a single table. 4. Clarify existing Charter provisions regarding civil service exempt hires to ensure that all future City managers and policy-makers serve in an at-will status. 1. Ensure that civil service examinations are continuously available when appropriate. 2. Allow departments to administer their own employment examinations, rather than forcing them to use DHR’s centralized testing, if the departments so choose. 3. Narrow existing Charter provisions allowing for “provisional” hiring. 4. Eliminate traditional examinations for licenses and apprentice classes, allowing established and reliable external measures of qualifications to serve as evidence of merit. 5. Round test scores to be consistent with the predictive power of the test. 6. Increase mandatory probationary period length for all employees serving in a new position to one year before they become “permanent” and require an active decision by management concerning civil service status at the end of a probationary period. 7. Dramatically increase the amount of employee training and education available to employees, and require that all supervisory and managerial employees be properly trained. 8. Require that job performance of existing employees be reviewed and assessed periodically and establish a City-wide review committee chaired by the DHR Director to ensure that evaluations are conducted properly, and that they are meaningful. 9. Link promotions to training and performance. 10. Add additional salary step increases, linked to performance. 11. Contract with an outside consultant to help determine high-level manager salaries based on performance and market data. 12. Publish a regularly updated comparative study of City employee salary and benefits. Over the past year, SPUR has been studying San Francisco’s personnel system in an effort to discover potential improvements. SPUR has been fortunate to work closely and collaboratively on this endeavor with an informal group of current and former City staff to consider the changes, both small and large, needed to improve the system. Although consensus was not reached on all of the report’s recommendations, the process gives us great hope that there are a number of practical and politically realistic changes that will make the City a better place to work and a more effective provider of public services. San Francisco’s human resources systems are antiquated and cumbersome, and are a central reason for the increasingly widespread perception that San Francisco’s government agencies have difficulty delivering services to the public in a timely and efficient manner. The problem does not lie with the quality of employees or managers, but rather the system itself. San Francisco’s workers and managers work within a system that often fails to take full advantage of their abilities, fails to enhance those abilities through appropriate training, and fails to recognize and reward their contributions. A common complaint of many public employees is the demoralization they experience because of the lack of appropriate consequences for the small group of City workers who fail to put their full effort into their jobs, and a corresponding lack or recognition of those who “go the extra mile.” Despite performing critical services and often literally taking their lives in their hands, outside the workplace they face the public perception of government as a clumsy, stifling, red-tape-laden environment. As a progressive city, San Francisco should treat its employees well. At the same time, we must recognize that the services provided by those employees are essential for allowing San Francisco to live up to its values. The city’s voters have repeatedly expressed a desire for a high level of public services. We must recognize that being progressive means not just having the will to provide these services, but the ability to deliver them as well. The goal of responsive and responsible government is under attack in much of the country. Some who attack government do so simply because they resent taxes. But election after election has shown that San Francisco voters are willing to pay for government if they are confident that government can deliver on its commitments. It is no coincidence that bond issues in San Francisco have passed to restore our libraries, schools and museums while voters have consistently rejected taxes intended to fund general government operations. San Francisco and other progressive cities like it cannot hope to continue raising additional revenue unless they show that government is the most effective tool available to meet citizens’ goals. A strong, effective public sector, backed by the confidence of citizens, is critical to San Francisco’s future. As a city that has historically called on government to accomplish important social and economic goals, and trusted in its ability to do so, San Francisco is uniquely positioned to show by example that public institutions can both serve important social functions and do so effectively, and that continued investment in urban government is worthwhile. But at the end of the day, the quality of our City government depends directly on the City’s ability to support and manage the people who work for it. We can only expect to have an effective public sector if its workforce is well trained, properly compensated and well managed. The concepts underlying the reform movement of the early 1900s leading to the creation of civil service systems throughout government were, in many ways, far ahead of their time. The notion that employees should be selected and promoted based upon true merit, as opposed to their social contacts, political views, race, religion, or nationality, remains the ideal that most employers—government or private—strive to achieve. But as with many progressive concepts, implementing the ideals of civil service has proved far harder than articulating them. Throughout the country, there have been complaints about the poor performance of governments under civil service systems—unmotivated employees, poor management, lack of a “customer service” orientation, under-qualified employees—to name just a few. It is a virtual cliché that it is “impossible to hire and impossible to fire” government employees. How could a system devoted to recognizing the “best and the brightest” become the very symbol of mediocrity almost everywhere it is employed? There are many answers to this question, some of which are explored in this paper. However, a number of problems are obvious in hindsight: (1) formal testing to assess merit is difficult, imprecise, time-consuming and expensive; (2) the strongest predictor of employee success is past performance, which most civil service systems ignore, for fear that measures of performance will be susceptible to subjectivity and bias; (3) civil service systems often provide little incentive for employees to excel, and tend to protect employees with poor performance; and (4) civil service protections have been converted from safeguards against arbitrary employer actions, to virtually absolute job security as public sector collective bargaining systems have been layered over existing civil service systems. Whatever the inherent flaws in the civil service model , it must also be recognized that times have changed. Civil Service systems were designed with the goal of preventing corruption and patronage in government employment; they were not designed to be efficient or well-managed systems. At the turn of the century, when governments were smaller, government’s role circumscribed, and government salaries low, prevention of patronage was the overriding concern. Today, while prevention of patronage is still an important goal, other concerns have increasingly come into play. Government is called upon to perform many sophisticated tasks, and it has grown to meet these demands. Government employees are better compensated. The political climate has changed. Just as taxpayers have been pressed to be more productive and efficient in their own jobs, they expect the government, which they fund, to be productive and efficient. The problems of the civil service system have been exacerbated by the layering of collective bargaining on top of civil service protections. At the time civil service systems were created, public employees had no right to bargain, and, generally, were not unionized. But since collective bargaining became integrated into many public human resources systems (in California beginning in the 1960s), tensions have developed between the overlapping principles and goals of civil service on the one hand, and collective bargaining on the other. These tensions arise from two sources. First, civil service systems are based on the concept equal treatment of employees, “merit” in individual personnel decisions, and political insulation of rulemaking. By contrast, under collective bargaining, treatment of employees will vary with their power at the bargaining table. Personnel decisions frequently are based on seniority or other objective criteria, and contracts are negotiated and approved by politically elected officials. Second, each system imposes its own set of limits on managerial discretion that, when taken together, leave very little room for the type of flexibility and innovation government needs to deliver services to the public. Many discussions of human resources reform focus on cutting costs, working under the assumption that public employees are overpaid and defining “efficiency” in terms of costs savings from paying employees less money or reducing benefits. But this line of thought is overly simplistic. The most meaningful measure of a public human resource system’s efficiency is not how much it spends per employee, but rather the quantity and quality of public services produced per dollar spent. In other words, while compensation levels are an important issue, reducing or increasing compensation of employees does not in and of itself make for better government. We believe it is far more effective to try to increase productivity than to reduce pay and benefits. San Francisco’s human resources policies are defined in large part by its civil service system (also called the “merit system”), which has developed over the past 100 years. In many respects the City’s merit system is typical of older American cities and states. Merit systems in the United States were originally developed in response to concerns over patronage and the “spoils system,” which was in place in most governments through the late 1800s. Elected officials at that time rewarded their political supporters with government jobs. In many cities, public employees were expected to provide time and money in electoral support for their patron officials, and successful electoral challengers removed existing government employees and replaced them with their own political supporters. Political momentum against institutionalized patronage began to grow in the second half of the 19th century. Reformers argued the patronage system was unethical because it often awarded jobs, paid for with public money, to individuals who were unqualified. It represented a use of public resources for private gain that was contrary to the public interest and effective government. In addition, since there was often massive turnover in the public workforce as newly elected officials removed the opponents’ supporters from government jobs and installed their own, there was instability and a lack of the institutional knowledge and experience that came from the presence of career public servants. The political landscape, too, began to change as office holders and political organizations began to view civil service reforms as an opportunity to lock their supporters permanently into government positions. The concept at the heart of the civil service reforms was to institute a system using objective examinations to determine the suitability of prospective employees for the job in question, and award positions to the most qualified applicants rather than an official’s most ardent political supporter. The idea of using written examinations to select civil servants was not a new one. Examinations to determine fitness for employment were first used in China starting beginning in 206 BC, and began to take hold in Europe in the 17th Century. In the United States, calls for reform of the federal government began near the end of the Civil War, eventually resulting in the Pendleton Act of 1883, which permanently established a Civil Service Commission to create rules governing examinations for prospective employees. The powers and influence of the Commission were expanded over time during the 20th Century, and similar systems subsequently developed in state and local governments across the country. San Francisco was relatively early in adopting a merit system. It was preceded by New York and Chicago, but was the first city on the West coast to institute competitive examinations. The San Francisco Civil Service Commission was established in 1900, and charged with administering the City’s merit system. Like the federal government, the Commission’s influence expanded over time. While originally responsible only for testing, San Francisco’s civil service system has grown to include administration and rulemaking about probationary periods, leaves of absence, layoffs, dismissals, and other topics. As the strength of labor unions increased throughout the 1900s, so did their impact on the personnel policies of public organizations. Labor organizations advocated for unionization of public employees at different levels of government. In 1968, the California legislature adopted the Meyers-Milias-Brown Act, which gave city and county employees in California broad rights to unionize, and obligated their employers to “meet and confer” with unions over compensation. Following labor disputes and strikes in the 1970s, San Francisco adopted a wage-setting formula for public employees based on comparisons to other jurisdictions. Over time dissatisfaction with the formula approach for determining compensation began to grow. In 1990, 1991 and 1994 San Francisco voters adopted Charter amendments that changed the City’s collective bargaining processes to permit negotiation of most terms and conditions of employment except retirement and certain matters related to the merit system. These merit system-related topics that are excluded in the Charter from collective bargaining are referred to as the “civil service carve-outs,” because they are “carved out” from the collective bargaining process. San Francisco’s bargaining system is unique because unresolved collective bargaining disputes with any of its unions are decided by arbitrators. Under this process, if the parties cannot agree on a contract, a neutral arbitrator is selected, and, after a hearing, the arbitrator picks the “last best offer” of one or the other party on each issue remaining in dispute. The City is then required to implement the arbitrator’s decision. This process—generally referred to as “interest arbitration”—differs sharply from the far more common “rights arbitration.” In rights arbitration, an arbitrator applies the language of a union contract to a particular set of facts and, by interpreting the contract and bargaining history, decides whether the contract was violated. Rights arbitration includes disciplinary arbitration— where an arbitrator determines whether the employer has met the contractual requirement of “just cause” for discipline. Through “interest arbitration,” on the other hand, an arbitrator actually shapes the terms of the contract itself, rather than settling a dispute surrounding an existing contract. Interest arbitration has become fairly common in California for safety employees (e.g. police officers and firefighters) who, under state law, lack the ability to strike when an impasse is reached in negotiations. By contrast, only one other city in the United States—Vallejo—provides interest arbitration for its miscellaneous non-safety employees. Combined with the fact that San Francisco negotiates with nearly 50 unions—more than three times the number of L.A. or New York, interest arbitration places a great strain on City resources. Further, because interest arbitration encompasses not only economic items, but work rules, there is great potential for the creation of inconsistent rules applying to different bargaining units as a result of different arbitration outcomes on different contracts. In 1993, voters approved a Charter amendment reorganizing the City’s human resources function. Proposition L consolidated labor negotiations (formerly under the mayor), administration of the civil service personnel system (formerly under the Civil Service Commission), administration of the employee health benefits system (formerly under the Health Services Board) and workers compensation (formerly under the Retirement Board) under a new Department of Human Resources (DHR). These functions remain under DHR today, with the exception of the employee health services system, which voters returned to the control of the Health Services Board in 2004. While 1993’s Proposition L consolidated a number of human resources functions, it remains true that there are many points of authority within the City and County of San Francisco. For the sake of clarity, we briefly review these points of authority. • Department of Human Resources (DHR). DHR is the personnel department for the City. It is responsible for conducting civil service examinations, recruitment, training, evaluation, promotion, job classifications, employee discipline and discharge, and “other related personnel activities in order to maintain an effective and responsive workforce.” The DHR Director is selected by the mayor from a list of candidates submitted by the Civil Service Commission, subject to confirmation by the Board of Supervisors. The Director serves at the mayor’s pleasure, provided that the mayor’s removal of the DHR director can be rejected by a 4/5 vote of the Civil Service Commission. • The Employee Relations Division (ERD) within DHR conducts collective bargaining negotiations on behalf of the City. Originally under the Board of Supervisors (most California cities and counties place responsibility for bargaining under elected boards), ERD was later moved under the mayor, and finally placed under DHR by Proposition L. Thus, DHR is responsible for both bargaining and administration of the civil service system. • The Civil Service Commission (CSC). Prior to Proposition L, the CSC was responsible for both rulemaking and administration of the City’s human resources systems. Under Proposition L, administration was transferred to DHR, but the CSC retains its rulemaking authority. The CSC consists of five members, appointed by the mayor to staggered six-year terms. Currently, it has authority for adopting the Civil Service Rules, subject to state law meet and confer requirements. In addition, the CSC has the power to “institute and prosecute legal proceedings for violations of any civil service merit system or Department of Human Resources” provision of the Charter, and the authority to investigate merit system abuses and discrimination in employment. The commissioners may only be dismissed for cause. • Retirement System. The City operates its own retirement system and trust fund. The Retirement System Executive Director reports to a seven-member retirement board, three of whom are elected retired or current City employees, three appointed by the mayor, and one by the President of the Board of Supervisors. The Retirement Board members serve five year staggered terms, and may only be dismissed during those terms for cause. The Retirement Board has no direct control over the negotiation of retirement plans. Under the charter, any changes in the formula for calculating retirement benefits must be approved as a Charter amendment by the voters. However, through ERD, the City can and does negotiate regarding the share of retirement contributions paid by the employees and the City as part of its labor contracts. • Health Service System. As noted earlier, the City operates a Health Service System to oversee health benefits, which now reports directly to the Health Service Board, as it did before 1994. The Health Service Board is made up three elected members who are either active or retired City employees, one appointee by the Board of Supervisors, one by the City Attorney, and two by the Mayor. The Health Service System operates as a trust, and does not generally negotiate regarding health plan design. • City Departments. Many City departments have departmental rules, which are subject to a state requirement to meet and confer with unions before they are established. Some individual departments also meet and confer over other subjects within the scope of bargaining, such as the impact of layoffs. Some larger City departments have “decentralized” units of DHR, which can, among other things, administer tests and handle investigation of Equal Employment Opportunity (EEO) complaints. • The City Charter. The Charter is the City’s “constitution.” It defines the authority of various agencies, including DHR, the Civil Service Commission, Board of Supervisors and Mayor in personnel issues. While many of the more detailed provisions were moved from the Charter to the Civil Service rules in 1991, it still contains various provisions on discipline, leave, and collective bargaining. It also contains the “carve outs,” which are the set of issues exempt from interest arbitration with employee unions. • Civil Service Rules. The Civil Service Rules are a set of long, complex provisions with detailed guidelines on testing, hiring, position classification, layoffs and dismissal that have evolved over the decades. Civil Service rules can currently be created or amended by the Civil Service Commission. • Memoranda of Understanding (MOU). MOU are the agreements negotiated between the City and its employees’ unions. The City currently has 48 different MOU (with the 48 employee unions), covering salaries, layoff procedures, benefits and a wide range of other issues. MOU are negotiated by DHR, and approved by the Board of Supervisors. • Departmental Rules. Individual departments must also develop rules specific to their own circumstances. • Ordinances. Other legislation also plays into the City’s human resources practices, including the Annual Appropriation Ordinance (budget), Annual Salary Ordinance (which details the number and type of positions a department can have during a year), and Salary Standardization Ordinance (which sets salary levels for various position types). As might be expected from multiple sets of rules that have evolved over decades, these different sets of policies are cross-cutting—to the extent one set of rules provides discretion, another set of rules often forecloses the exercise of that discretion. As a result of these multiple rules, much of City managers’ focus in the City must be simply on navigating the system in order to meet programmatic goals, rather than on defining and strategic planning about the achievement of the goals themselves. The fact that authority is so dispersed makes it difficult for the City to develop a coherent, much less a strategic, set of employment policies. The inability to develop a single, strategic set of employment policies lies at the heart of the City’s present difficulties in the realm of employment. Despite the good intentions of combining personnel functions in the Department of Human Resources, in many respects the Proposition L reforms have not fulfilled their promise. Although DHR contains both labor and personnel functions, they have been poorly integrated. Relations between labor negotiators and personnel administrators are frequently strained. Labor negotiators are frequently perceived by personnel professionals as too political, too anxious to make “deals,” and not sufficiently concerned with issues such as uniformity of rules or ease of administration. Labor professionals, on the other hand, sometimes perceive personnel professionals as “small minded,” inflexible, bureaucratic, and oblivious to political imperatives and the practical need to prevail in interest arbitration. As a result, the City has never successfully integrated the personnel system and the labor relations system. Nor has the linkage between employee benefits and personnel/labor been accomplished. The retirement system operates completely independently of the personnel system, as does the payroll system. Even though the health benefits system was in DHR for about ten years from the mid- 1990s until 2004, health benefits continued to be governed by a Health Service Board and a Charter formula. The problems with San Francisco’s hundred-year-old civil service system are exacerbated by its often uncomfortable intersection with the relatively new collective bargaining system. From the beginning, the fit between collective bargaining and civil service systems was awkward at best. One of the more notable admissions of the problem is in the preamble of the Meyers-Milias-Brown Act (the act that established collective bargaining in California), which says the act shall not “be deemed to supersede…the charters, ordinances, and rules of local public agencies which establish and regulate a merit or civil service system” but “instead, to strengthen merit, civil service and other methods of…employer-employee relationships.” Yet, ultimately, courts have concluded that collective bargaining rights generally trump civil service protections. The tension between the two systems arises from two sources. First, the goals and purposes of the two systems are very different. Civil service systems operate from the premise that all employees should be treated equally. Collective bargaining systems are based on the notion that the more powerful groups will do better in negotiation than other less powerful groups. Civil service selection systems aspire to be based on testing and “merit,” while collective bargaining selection systems generally emphasize seniority. Civil service systems generally give rulemaking authority to a politically insulated commission; collective bargaining systems are more overtly political, with decisions almost always delegated to elected boards or chief executives. The second tension arises not from the differences in the systems but their similarities. Both systems are designed to limit the exercise of managerial discretion—in both cases, in order to ensure fairness to employees. Ultimately, these tendencies substantially limit management accountability. Modern management practice recognizes that the exercise of discretion by managers is an essential ingredient for good hiring, promotion, assignment and evaluation. By reducing discretion exercised by managers, both systems ensure greater fairness at the cost of efficiency and effectiveness. Strikingly, however, it is the combination of civil service and collective bargaining systems that creates the biggest problem because together, they virtually eliminate all managerial discretion. For example, under a pure civil service system, the rules are generally within the discretion of a citizen-run commission that is free to change them as the need arises. Conversely, collective bargaining can be a flexible system of give and take—but, with civil service rules locked in, management has little discretion to bargain work rules geared toward greater efficiency.2 In sum, layering collective bargaining on civil service protections has created personnel gridlock. Whereas civil service rules could be analogized to pebbles with spaces in between, collective bargaining essentially poured cement in the spaces. The combination of civil service reform and collective bargaining can be especially deadly because it is all-too-easy to replace the limited ability of civil service systems to discern “merit” with the union-championed mantra of seniority—which does not even pretend to be a surrogate for merit. Any attempt to recreate the pockets of air—room for the exercise of managerial discretion— must begin with the recognition that human resources is a politically charged subject where San Francisco’s pro-labor orientation will figure prominently. Three states (Texas, Georgia and Florida) have all but eliminated their civil service systems, but all three are right-to-work states without powerful unions. 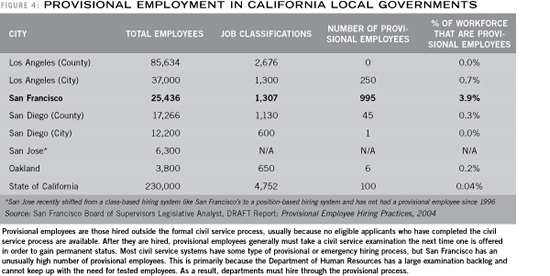 Eliminating civil service is neither realistic nor appropriate in San Francisco. Instead, the existing systems of civil service and collective bargaining must reconciled in a way that preserves the ability of managers to manage. Over the past decade there has been a great deal of attention to public human resources systems. During the early 1990s, several high-profile calls for reform focused on human resources as a key ingredient in improving government performance, including Osborn and Gaebler’s now-famous book Reinventing Government and the National Performance Review, led by then-Vice President Al Gore. Since then, there has been a proliferation of research on the topic from academics, public agencies, and non-profit organizations. Much of the literature on government human resources systems is surprisingly consistent in the trends and best practices identified. One of the broad themes that is nearly universal in the literature is the trend toward decentralizing of human resources functions in public organizations, with central agencies providing consultation, tools, and guidelines used by agencies with responsibility for implementation and decision making. Historically, many personnel functions in city governments have been under the jurisdiction of a highly centralized personnel agency, such as a human resources department or civil service agency. As the size and complexity of governments increase, and the difficulty of meeting ever more specialized personnel needs outpaces the capacity of central personnel offices, many of those functions are increasingly being delegated to department or agency managers. Of course, centralization and decentralization are a matter of degree, and different governments arrive at different balances. The primary advantages of a centralized HR system include consistency and economies of scale in certain operations. Many urban civil service systems were developed at a time when the overriding need was to sort through a large pool of applicants to find employees most capable of performing highly structured, repetitive tasks. In such a situation, the economies achieved by an office with the capacity to administer testing to a large number of applicants for jobs requiring easily measurable skills were substantial. However, best practices literature emphasizes the increasingly specialized, knowledge-intensive needs of many government agencies, and the resulting inability of highly centralized personnel offices to perform many basic human resources functions efficiently. A major research report from the State of Washington similarly identifies decentralization as an effective human resources practice, with central agencies assuming a consultation and support role and personnel actions delegated to managers. The following are examples of specific human resources policies adopted by public organizations. • Shortened Hiring Times. City and state governments are working to improve recruitment efforts and shorten the length of time needed to hire qualified individuals. Many cities have substantially decentralized hiring processes to managers so they can hire quickly without extensive central involvement. Seattle, for example, has entirely delegated responsibility for testing of prospective employees (except public safety workers) to individual departments. Indianapolis overhauled its hiring system, eliminating a highly complex set of rules and regulations from a system previously regarded as highly politicized. The City has shortened the length of time required to hire a new employee from months to under two weeks. San Jose has moved from a class-based hiring system (like San Francisco’s, where exams are used to determine eligibility for any job in a given classification) to a position-based system, where exams are used by departments to determine eligibility for a single open position. For more on this, see chart "Permanent Civil Service Hiring Process". • Compensation Flexibility. Many public personnel systems are relatively restrictive in terms of the salaries associated with specific positions. Jobs are often associated with set pay levels, which increase incrementally over time. The inflexibility of these systems prevents managers from adjusting salary levels to fit the qualifications of individual applicants and negotiating with prospective employees. In response, many jurisdictions are allowing managers greater flexibility in determining salaries based on individuals’ qualifications. • More and Better Training. Training is often one of the first things cut in difficult budgetary times. But some cities are moving toward systems where training is viewed as a fundamental cost of employment and indispensable motivational tool, not as a luxury. All of the top cities in Governing Magazine’s Grading the Cities report train extensively. Austin, Texas conducts citywide assessments of training needs, and targets it programs accordingly. Phoenix has mandatory training for managers, reimburses employees for attending college courses, and all employees receive ethics training. • Performance Measurement/Evaluation. Use of formal, uniform performance evaluation is growing increasingly common. Missouri and Wisconsin have instituted systems that prohibit authorizing pay raises for managers if they have not adequately evaluated the employees they supervise. • Linking Job Performance to Compensation, Promotion. As strange as it may sound to those who do not work in the public sector, promotion and compensation are often determined by the length of time an employee has spent on the job, not how well the employee performs. Nashville, Tennessee, Hennepin County, Minnesota and Denver all have systems in place that take into account both performance and seniority in making these decisions. Santa Clara County uses performance objectives and evaluations to set compensation for high-level managers. The evidence on performance pay in public jurisdictions is mixed at best, with many studies showing little or no effect. However, many jurisdictions are experimenting with new ways to use compensation as an incentive, and moving away from automatic, longevity-based compensation structures. • Linking Job Performance to Layoff Decisions. Like San Francisco, many classic civil service systems historically used seniority to determine which employees would be first to go in the event of layoffs. Employees with a longer tenure are entitled to displace less senior employees, without regard to job performance. Increasingly, state and local governments are factoring in performance assessments to determine the order in which employees are laid off. Eighteen states now use performance evaluations as a factor in layoff decisions, often in combination with seniority. Cities including Austin, Dallas, and Nashville also consider performance in layoff decisions. • Expedited Dismissals. Along with hiring, the inability to fire underperforming staff is a common complaint among employees and officials in traditional civil service systems. Unlike “at-will” employees in the private sector, public employees often have access to a long sequence of appeals and other avenues in the event they are fired. While these protections were designed to protect against politically-motivated dismissals, some jurisdictions are finding ways to shorten the timelines and lower costs associated with the process. New York state reduced the average length of time to resolve contested employee dismissals, which used to take six to 18 months but now are resolved in 30 to 60 days. Instead of the old process of a sequence of appeals and arbitration, the state now uses a single round of expedited, binding arbitration. • Motivation. Many jurisdictions have focused on finding ways to motivate employees. These include financial incentives, such as structuring salary increases so they are based on performance. But they also include other methods such as increased recognition for employees, providing opportunities for training, career development, advancement, and lateral movement within the organization. • Workforce Planning. The Government Performance Project study identified workforce planning as an investment critical for public human resources management. Workforce planning involves determining the future staffing needs of the organization, taking into account demographic and social changes that may affect the demand for new employees and availability in the labor market. Many of the high-performing states identified in the GPP study had centrally-prepared workforce plans. These efforts are becoming increasingly important in many jurisdictions as Baby Boomers, who represent a disproportionate number of government employees, are reaching retirement age. Human resources systems and processes are the most fundamental tools government can use to affect the quality and efficiency of its operation. But it must be acknowledged that none of these systems or processes is an end in itself—they are tools used to accomplish organizational goals. Ultimately, they must be judged by how well they serve the purpose of helping government achieve its desired effects. At the most general level, improvements to San Francisco’s human resources systems will require shifting from a rule-based system to a system where rules and processes are used strategically to accomplish organizational goals. The shift to a strategically-oriented human resources system requires transforming DHR from a primarily administrative and regulatory agency to one focused on providing support, resources, and information to help employees and departments meet their goals—an approach highly consistent with academic literature and best practices from other jurisdictions. In its current form, DHR is primarily a regulatory and administrative agency. It is an agency built around the concept of human resources as series of transactions. Tests are developed and administered, forms are processed, decisions made regarding whether departmental behaviors conform to the rules. It is responsible for processing employee transactions and regulating department behavior—much like a purchasing department might be responsible for locating, evaluating the quality of, and processing the “widgets” that figure into a productions process at a manufacturing plant. Increasingly in modern organizations, human resources departments are not simply centers of administration for personnel transactions and enforcers of rules. They take on a primarily facilitative and supportive role, charged with providing the tools and resources needed by parts of the organization to ensure they have excellent, satisfied, and productive staff. In San Francisco, like many other governments, personnel administration has taken on a life of its own, and many administrative processes in the civil service system are viewed as an end in themselves, rather than a means of helping government function fairly and efficiently. Instead of being a gatekeeper for personnel transactions, DHR should be transformed into an agency that is primarily concerned with meeting the needs of its “client” agencies and the workforce—whether those needs are for greater assistance from DHR in navigating the complexity of human resources issues, or simply for DHR to stay out of the way. As a modern personnel department, DHR should provide tools, services, and support to departments and employees according to their needs. Ultimately most critiques of civil service systems, whether explicitly or indirectly, are based on the concept of motivation. The primary purpose of an HR system, aside from entry level hiring, is to make sure employees have a work environment in which they are motivated and enthusiastic about their role in helping the organization achieve its goals. Thus, creating such a positive, rewarding work environment for City employees is a fundamental part of restructuring San Francisco’s human resources systems. But there are added complexities for public sector organizations in particular that make achieving this vision difficult. Unlike the private sector, public agencies cannot make financial incentives the primary basis for motivation because compensation is not performance-based, there are no stock options, and, in reality, unmotivated employees often fare as well under civil service systems as motivated employees. As a result, even highly motivated individuals, given enough time, receive the message that there is little economic value in working hard or going the extra mile. Thus, the effort to shift from a rule-based system to a strategic system in San Francisco requires rethinking how human resources policies can be structured to create an environment where employees are enthusiastic about their jobs and the opportunities available to them. For the last twenty or so years, “pay for performance” has been a mantra in discussions of motivation. The City even implemented a pay for performance system for its managers, although that system has fallen into disuse. The primary difficulty with the pay for performance system was that the amounts of money available were too small (up to 3%), and the effort involved in administering the program was perceived, rightly or wrongly, as too great. 5 Unfortunately, most studies of pay for performance in public agencies find similar patterns. In large part, this is because, politically, giving large “bonuses” to the City’s highest paid employees is simply unpalatable. This is especially true in a unionized environment, where unions representing lower paid employees use these “bonuses” as a basis for wage demands. These problems are not easily resolved. We submit, however, that money is only one form of motivation, and that people are often motivated by non-monetary psychic rewards. Particularly in the public sector, many employees are motivated by a strong desire to help people and “make a difference.” Indeed, notwithstanding the external rhetoric, one really remarkable aspect of City government is the very large number of employees who work hard and perform heroic deeds on a daily basis, notwithstanding the lack of appreciation. One reason for this fact is that much of the City’s work is in the public interest— helping people. Fortunately, many workers are committed to the work they do. The City should build upon that motivation by recognizing and showcasing its employees who deliver excellent services on a daily basis.6 In addition, the City should be a place where employees have ample opportunity for learning, career development and advancement—all of which provide meaningful, non-monetary rewards to excellent employees. Changes to San Francisco’s human resources policies should proceed with this fundamental goal in mind. The recommendations in this report are divided based on the different levels and parts of the process that they address. First, we examine broad structural issues related the way rules and decisions are made, and the roles of the various agencies involved. We call these “structural” recommendations. Next, we examine current policies related to specific segments of the employment cycle—from recruitment through the time an employee leaves the City. Most public agencies with a civil service system rely on some form of civil service rules, which provide guidelines for carrying out core personnel transactions such as examinations, hiring, and layoffs. There are a number of different models regarding how these rules are created and modified. Many jurisdictions give authority for rulemaking to an appointed, unpaid (or nominally paid), part-time citizen board or commission. San Francisco’s current system is most akin to this model, with rulemaking authority under the Civil Service Commission. An increasingly common model in other jurisdictions gives rulemaking authority to the professional staff of the personnel agency, with an appointed board as an appeals body to serve as a “check” against personnel department actions if needed. For example, Washington State, as part of the recent overhaul of its personnel system, recently shifted to this type of system. Rulemaking authority was transferred from the Washington Personnel Resources Board (WPRB) to the director of the personnel department, and the WPRB assumed the primary responsibility of hearing appeals on civil service matters. Other jurisdictions use a blend of the two approaches. Philadelphia, for example, gives the personnel department rulemaking authority, yet requires civil service commission approval of proposed rules before they go into effect. San Francisco should move to a system where rulemaking authority rests with its personnel department, namely the Department of Human Resources. The purpose of this change would be to better integrate the rulemaking function with the operational realities of the personnel system. Charter reforms in 1991 and 1993 in San Francisco transferred the administration of personnel matters from the Civil Service Commission to the newly created Department of Human Resources. Issues subject to interest arbitration under the new collective bargaining scheme fell under the jurisdiction of DHR. However, there were a number of issues explicitly excluded from the scope of bargaining subject to interest arbitration. Those issues, known as the “carveouts,” remained under the Civil Service Commission’s rulemaking authority. The purpose of the carveouts was to ensure that core merit system principles were preserved, and not subject to dilution through collective bargaining and/or interest arbitration. The result, however, has been a complex interface between collective bargaining and the merit system that results in great frustration for union and City negotiators. More important, the result has been to protect Civil Service Rules not only from bargaining, but from modernization. Rather than promoting reform, the present system has resulted in ossification. The commission is sparsely staffed, and divorced from the day-to-day operations of the City. Under state law, changes to some of the “carved out” civil service issues under the Civil Service Commission’s rulemaking authority require the City to “meet and confer” with the Unions before changes can be implemented. Thus, rule changes cannot simply be made by the commission, but must be bargained with employees—a daunting task for an agency with few staff. Even if it were inclined to do so, the commission is not equipped to bargain with the City’s nearly 50 employee unions. At various times, the Commission has had a single labor negotiator—but that was before the budget cuts of the last few years. Now, if the Commission were inclined to overhaul employment rules it would need to rely on the Employee Relations Division for the negotiation—an awkward fit at best given the tension between the personnel and labor relations systems in the City. In our view, the likelihood that a flexible, coherent, and modern system of rules can be established would be improved if rulemaking authority were transferred to DHR. This would enable “one stop shopping” for both City departments and unions, and better permit the development of rules to be guided by strategic considerations. Some argue that much the same result could be accomplished with the existing system if the DHR Director were to submit proposals for rule changes to the Civil Service Commission. But this misses the point. Nothing in this report should be construed as a criticism of this, or previous Civil Service Commissions. The point is simply that the responsibility for a coherent, strategic set of employment rules should rest in one place—the same place that is responsible for the rules regarding testing and hiring employees, setting compensation, evaluating employees, promoting employees, and so on. Civil service rules should must be made in light of the operational realities of a personnel system in a large, modern organization. Moreover, a system with divided responsibility for rulemaking and administration also limits the degree to which any one entity can be held accountable for the overall performance of the personnel system. As Keesling noted as the central reason for the 1932 charter revisions: “One of the greatest difficulties was created by divided authority, which made it impossible to fix responsibility.” Ironically, the 1993 amendments creating a separate Department of Human Resources and Civil Service Commission, although they were a step in the right direction, exacerbated this problem. San Francisco voters continue to be concerned about patronage appointments, and other core problems the civil service system is designed to prevent. The Civil Service Commission continues to perform an important role as an appellate body, to ensure the overall fairness of the system. We therefore suggest that the Civil Service Commission retain all of its other existing powers, and be renamed the Merit Appeals Board to more accurately explain its function since 1993. In addition, the commission could also take a more active role in the City’s disciplinary system, providing arbitrators and hearing officers on an expedited basis. This could address the very long standing problem of delays between disciplinary actions and the arbitrations regarding that discipline. In some cases, the City has been required to pay substantial backpay awards when employees are reinstated after long periods passed between the disciplinary action and the arbitration hearing. In addition, we recommend that the Commission hear (or hire hearing officers to hear) appeals from administrative determinations made on EEO complaints. Presently, the departments and DHR do an excellent job investigating EEO complaints. However, given the concern about possible litigation, having an independent body available to hear appeals would provide an additional layer of protection for the City. The purpose of these proposals is to allow a more responsive and efficient system for making changes to employee work rules, while maintaining the uniformity of work rules across different groups of employees. The civil service “carve-outs” are the critical intersection between the City’s collective bargaining and civil service systems. Drafted in 1991, charter section 8.409 et seq., the collective bargaining scheme for all non-safety employees except Muni drivers and nurses “carves” out from the bargaining authority of the Employee Relations Division “those matters… which establish, implement and regulate the civil service merit system.” The carve-outs go on to specify particular merit-related issues: “the authority, purpose, definitions, administration and organization of the merit system and Civil Service Commission; policies, procedures and funding of the operations of the Civil Service Commission and its staff; the establishment and maintenance of a classification plan including the classification and reclassification of positions and the allocation and reallocation of positions to the various classifications; status rights; the establishment of standards, procedures and qualifications for employment, recruitment, application, examination, selection, certification and appointment; the establishment, administration and duration of eligible lists; probationary status and administration of probationary periods, except duration; pre-employment and fitness for duty medical examinations except for the conditions under which referrals for fitness for duty examinations will be made, and the imposition of new requirements; the designation of positions as exempt, temporary, limited tenure, part-time, seasonal or permanent; resignation with satisfactory service and reappointment; exempt entry level appointment of the handicapped; approval of payrolls; and conflict of interest.” All of these topics are excluded from collective bargaining between the City and its employees. While the carve-outs may have been useful in the transition from a formula-based salary system to collective bargaining, it must be conceded that they have not functioned well. They have divided responsibility for collectively bargained issues between the Civil Service Commission (which is responsible for meeting and conferring with unions over proposed rule changes affecting “carved out” issues) and the Employee Relations Division (which regularly bargains with unions over issues reflected in the MOUs). In this respect, they undercut the concept, inherent in the 1991 reforms, that bargaining would be “one stop shopping,” where the City and unions could address labor issues comprehensively and as efficiently as possible. Because of the difficulties inherent in this divided system of negotiations, the carve-outs also effectively create a “floor” of rules that City management cannot change to create greater efficiencies. Moreover, the carveouts are amorphous, unclear, and subject to frequent disputes. Finally, in many cases, issues covered by the carve-outs are already excluded from collective bargaining under the Meyers- Milias-Brown Act—making them unnecessary as a matter of City policy. In short, the carve-outs have proven unpopular and of limited utility for both labor and City management. However, eliminating the carve-outs outright would raise serious issues: (1) how could the City prevent each of its nearly 50 unions from negotiating different personnel rules? (2) how could the City ensure that the poorly functioning merit-based system not be replaced with an even less flexible, bargained, seniority-based system? Unless it is properly thought through, eliminating the carve-outs could result in an even greater number of different rules, and even less managerial discretion than under the current system. This is a less significant issue in most other jurisdictions because the personnel agency is free to create rules, even in bargainable areas, subject only to “meet and confer” under the Meyers-Milias-Brown Act. But in San Francisco, not only are there many more unions than in other jurisdictions, there is also interest arbitration for miscellaneous unions—something that does not exist in almost any other jurisdiction in the country. This raises the concern that even if the City attempts to “hold the line” on changes to uniform rules, an arbitrator may agree to exceptions or changes for individual unions—leading to the patchwork of different personnel rules for different groups of City employees the carve-outs were in part designed to prevent. It would be extremely difficult and expensive to administer a personnel system with dozens of different sets of rules. Moreover, a wide variety of core work rules could foster a sense of unfairness and confusion among workers who would see other groups of employees being treated differently. For that reason, SPUR recommends that the core merit system matters previously within the carve-outs be placed under the authority of the DHR director, subject to meet and confer where required, but excluded from interest arbitration with individual unions. This would allow City management and unions to negotiate over matters concerning the merit system at a single table, and prevent the nightmare of administering 50 different sets of rules that would result if these matters were left to interest arbitration. In short, this change would allow greater flexibility in developing work rules, while also preserving a core set of work rules consistent across bargaining units. We also recommend that the matters covered by the carve-outs be pared down and clarified. Presently, the carve-outs read like the table of contents to the Civil Service Rules—which was actually the source document from which they were negotiated originally. At the same time, the carve-outs do not include a number of items that should, and in some cases must, be uniform throughout the City. For example, the carve-outs do not include leaves, vacation, or layoffs. These are clearly issues that, for the sake of fairness and consistency in personnel rules, should be uniform across unions. Under Section 10.104 of the current Charter, certain positions are designated as exempt from Civil Service exams and rules, including policy staff in the Mayor’s Office, elected officials and their chief deputies, department heads and their chief deputies, attorneys and others. Exempt high-level managers and policy staff can be hired and fired at the will of their appointing authorities. In order to provide public services effectively, it is critical that departments heads be able to choose and control their management team. Officials cannot be held accountable for the performance of their agencies if they do not have the discretion to at least appoint and remove the managers they desire. When they are unable to do so, they lose the ability to direct the affairs of the organization they oversee. Change so the charter refers in some way to level of responsibility, not specifically to “deputy” or others. The charter’s list of “exempt” employees, however, is at best incomplete. For example, the charter exempts department heads and their chief deputies. In small departments, this is more than sufficient. However, in larger departments such as the Department of Public Health, there are many high level managers who have far greater budgets, management discretion and authority than the heads of entire smaller departments. Attempts to address this issue date back at least to former Mayor Feinstein’s proposed reforms in the 1970s. Unfortunately, these reform efforts have all failed at the ballot box—primarily because of the voters’ understandable concern about the use of these positions for patronage appointments. The controversy during the Brown administration regarding “special assistants” demonstrates these concerns are alive and well. However, the fact that proposals to revisit the list of exempt employees have been brought forward repeatedly over the years is an indication of the frustration resulting from the current system. The list of exempt positions in the Charter should be rewritten to allow exemptions for staff based on their job responsibilities rather than simply their job titles. Expanding on the example used above, a greater number of high-level managers at large departments such as the Department of Public Health should be exempt, based on the high degree of management responsibility their jobs entail. One of the factors that slows down the City’s hiring process is the inability to test applicants in a timely matter. In many cases, applicants to the City must wait until an examination is held to know whether they will even be considered for a position, often for long periods of time between examinations. Because DHR often does not have the resources to conduct examinations frequently for all the City’s nearly 1,000 tested classifications, and lists of eligible individuals who have taken examinations are often out of date, departments lack timely access to qualified candidates. San Francisco’s typical exam process takes up to 14 weeks, compared with 40 days in Phoenix, 38 days in Denver, 56 days in San Diego and 55 days in Minneapolis.7 A draft Board of Supervisors Legislative Analyst report states that only 39 percent of job classifications have an active list of eligible employees. If the City is to rely on examinations as a core step in its employment processes, it must find a way to make testing available. To modernize its testing processes, San Francisco should increase the use of continuous testing. Continuous testing, used widely by other jurisdictions and to a limited extent in San Francisco, makes tests available continuously on a walk-in basis, rather than being held from time to time for a number of prospective employees at once. The use of technology has greatly reduced logistical barriers to continuous testing, although an initial investment of public funds would likely be required to make such a system possible on a widespread basis. DHR should conduct an analysis to determine which classifications present opportunities for the most costeffective use of continuous testing, and the mayor and Board of Supervisors should make the necessary resources available through the normal budget process. In many cases it no longer makes sense to have examinations conducted by DHR, when departments would be willing to take on the responsibility themselves in order to increase the frequency of examinations and, as a result, quicken the hiring process. As discussed elsewhere in this paper, the most effective state and local governments are moving toward human resources systems that are centrally designed, but administered on a decentralized basis and accompanied by monitoring to ensure compliance with rules and policies. Testing provides a clear opportunity for San Francisco to move in this direction. Under the proposed system, DHR would develop examinations and guidelines to prevent discrimination, favoritism, and otherwise undesirable behavior, just as it does today. However, instead of DHR administering the examinations, departments would be allowed to do so themselves if they so chose (departments without the resources to conduct testing on their own could opt to use DHR). Subsequently, a sample of personnel transactions would be audited to ensure testing was performed appropriately and in compliance with City rules and policies. Greater decentralization of testing, coupled with monitoring, will introduce greater flexibility into the hiring process and reduce delays caused by the backlog in DHR testing. Some testing is already decentralized in San Francisco. However, this limited delegation of testing has not been accompanied by clear regulations and procedures from DHR, nor has it been accompanied by a clear method of auditing compliance with City policies in testing and hiring. Without both in place, decentralized testing has the potential to become inconsistent and marred by charges of favoritism and ineffectiveness. Some argue that a better solution would be to increase DHR’s funding sufficiently to eliminate the backlog of exams. In our view, this is unrealistic. Even when the resources available to government were at their all-time high, there were large testing backlogs. In part, this is because elected officials—and, for that matter, the public—are not willing to pay for the number of additional employees that would be necessary to conduct sufficient testing to keep up with the demand. DHR has repeatedly had its budget cut during difficult economic times, since it is more politically expedient to cut “administrative” expenses like human resources than it is to cut departments that are perceived as providing services directly to the public. But perhaps more importantly, there is little reason to believe that, even if it were appropriately funded, DHR would be inherently capable of getting the same or better results than a decentralized system. A central agency often has difficulty prioritizing testing. On the other hand, if testing is placed in the hands of the departments that are clamoring for new hires, that department will be motivated to use its existing resources to test for the most needed positions. Indeed, since most departments already have a process for provisional hiring, there is little doubt they are capable of testing for permanent positions. The Charter allows employees to be appointed on a provisional basis—without taking an examination—for up to three years if no eligible list of tested employees exist. Provisional employees are required to take an exam for their classification the next time one is offered. The practice of hiring provisionally is primarily a result of the inability of DHR to keep up with testing for all of the City’s 998 job classes that are subject to civil service examinations. Since DHR does not have the resources to maintain certified lists for departments to select candidates from, or the lists are out of date and no candidates on the list are available, department are forced to either leave positions unfilled or hire through the provisional process developed by DHR. Thus, widespread provisional employment is a symptom of the inability of San Francisco’s merit system to function in a manner consistent with its goals. Although necessary given difficulties with testing, provisional hiring has few benefits. Departments must devote the resources to determine whether candidates are qualified. But even if the employee proves highly competent, she must still take a civil service examination up to three years later—and risk losing her job to a new applicant with a higher test score. The use of provisional employment is inconsistent with the goals of the merit system, since employees are hired without official testing. At the same time, provisional employment does not have the full administrative benefits of a more decentralized hiring system (since DHR is required to administer the exams anyway—only after the fact). Finally, provisional employees lack full civil service status, creating a situation where employees performing the same work receive unequal treatment, leading to a perception (and reality) of unfairness. Eliminating provisional employment outright, however, is not feasible, since it would eliminate the only means by which departments can hire staff when DHR is unable to keep up with testing requirements. The recommendation to limit the use of provisional employment, therefore, should only be adopted if it is accompanied by changes to the examination and hiring process. As recommended elsewhere in this report, such changes could involve decentralization of examinations or, at a minimum, increased capacity and funding for DHR to manage its examination workload. Some City employment classifications have professional requirements that serve as a surrogate for civil service examinations. Certain professions have already established mechanisms to test the competence of individuals. For example, electricians (public and private sector) are trained and evaluated through an extensive and established process of apprenticeship, learning, and development that is part and parcel of their industry. Similarly, many professions, such as architects and engineers, have established and reliable licensing practices, which determine qualifications with more accuracy than a City test. For such positions, there is little value added by creating and administering examinations at the City level, when well-established and more reliable measures of qualification already exist. DHR should be allowed to develop guidelines for classifications that are effectively “tested” by existing professional processes, and eliminate examinations for those classes. One common criticism of civil service exam processes is that they rank individuals based on minute differences in examination scores—sometimes scoring individuals down to hundredths of a point on a test with a scale of hundreds. While testing of different types has increased in sophistication over the years, there are limitations on the degree to which testing can accurately and objectively differentiate between the abilities of individuals. Including or excluding candidates from eligible hiring lists based on minute fractions of points is essentially arbitrary, and cannot realistically claim to be fair or identify superior candidates. Test scores should only be calculated to the degree to which an examination has been proven effective. For example, if analysis indicates an examination can make meaningful distinctions between candidates based on differences of 5 points out of one hundred, scores should be rounded to the nearest five, and candidates with equal scores after rounding should be given equal consideration in the hiring process. All civil servants in San Francisco are required by Civil Service Rules to serve a probationary period after appointment and before they acquire permanent status and full civil service protections. The probationary period is an important step in the employments process, as research and experience have shown, and common sense confirms, that observed performance is by far the single best indicator of future performance. The probationary period provides an opportunity to assess employee performance to a degree that testing cannot. Although probationary periods are defined by the Civil Service Rules as “the final and most important phase of the selection process… to be used for evaluating the performance of an employee in the position to which appointed,” in practice their lengths and the extent of their use as an evaluation tool vary widely. Probationary period lengths are often negotiated in collective bargaining, rather than formally established under the Charter or other rules. After the probationary period ends and an employee receives permanent civil service protections, it becomes much more difficult to release the employee as a result of underperformance. Consequently, the probationary period should be extended to a length of time that offers adequate assessment. Employees who pass through the period will have a stronger “claim” on their civil service protections, since managers will have had a better opportunity to evaluate them before becoming permanent. According to the Government Performance Project survey, one third of major cities have a probationary period longer than 6 months, and a handful have periods as long as 18 months. SPUR recommends the probationary period for new hires be extended to one year, and that the length of the period be established in the Charter. On some occasions, the completion of the probationary period passes by unnoticed and employees receive permanent civil service status by default. There should be a conscious decision made at the end of the probationary period as to whether the employee should be granted permanent status. Although appointing officers are required to notify DHR on completion of the probationary period, this is often a formality completed after the fact rather than an opportunity for constructive evaluation. Requiring managers to make a conscious near the end of the probationary period will help them to be used more productively. Training is an absolutely critical function of any human resources system. Training is needed not only to enhance the skills of City staff, but also as a way of helping employees stay motivated. As discussed elsewhere in this report, public agencies generally do not have the option of motivating employees with financial incentives. Instead, it is critical that governments find other opportunities make sure employees are engaged and enthusiastic about their work. One strong motivator of employee performance is the opportunity for advancement. In this area, the City’s present HR systems have utterly failed. In the City, as in many civil service systems, there is a bizarre anomaly. Because civil service testing is so backlogged, many promotions occur initially through “provisional appointments.” Often, the employees chosen for these provisional appointments are the best performers. However, when it comes time for a civil service exam—necessary to become permanent—performance on the job, technically at least, is not a consideration. It goes without saying that the single best predictor of future employee performance is past employee performance. Past performance should weigh heavily in any promotional system. A central difficulty with this concept is that, absent additional training, often employees who perform well at one level cannot succeed in a higher level supervisory or managerial job without additional education and/or training. And this, more than anything else, is where the City fails its employees. San Francisco does a very poor job of providing training for employees. In part, this is because training is always the first item to be cut in difficult budget times. In part, it is because DHR has never had the funding to create a strong, centralized training department. In part, it is also because the City, as an institution, has never valued or recognized training and education in compensation, promotion, or in any other way. Ironically, this is true, despite the fact that many of the City’s best managers are the products of the few high quality training programs in which some City departments have participated. The San Francisco HR system should create a “culture of learning.” Just as the Army attracts new recruits with promises of education and training, San Francisco government should attract and retain workers with very high quality education and training. Training should be valued in the San Francisco culture. Employees who go through training should be recognized and, if successful in training, should have first opportunities for promotion. The City should pay for training, and provide incentives—including, perhaps, the ability to use some work time for jobrelated training—for employees to go through training. The City should also create a “University of the City,” perhaps in cooperation with the San Francisco Community College District or University of California. This association would be intended not only to foster training programs directly related to job duties, but educational advancement generally. Significantly, in this regard, even in the absence of training incentives, the City had a small program with UC along these lines that was consistently oversubscribed. Aside from general skills training and education, the City must institute a rigorous training program for supervisors and managers. Successful completion of this management training program should be an ironclad requirement of passing probation. As things stand, many employees are promoted to supervisory positions without even rudimentary training in supervisory skills and laws governing their conduct. This is an open invitation not only to lawsuits, but to bad management. In a modern workplace, it is nothing short of irresponsible to promote employees to management roles without providing the basic training needed to allow them to succeed. It will be critical to ensure performance evaluations are conducted appropriately. In a modern workplace subject to EEO laws, performance must be measured by objective, verifiable measures. This will require DHR to perform a high level of oversight to ensure that the discretion inherent in all job evaluation systems is monitored on a post-audit basis, and that supervisors and managers who evaluate employees are well trained. In a unionized workforce, if job evaluations are to be used in the promotion process, unions may argue that performance evaluations be subject to the grievance procedures of their contracts. In our view, this could constitute a huge burden for the City. It is therefore in the City’s interest to establish a fair, speedy, and uniform process to oversee the performance evaluation program. It seems counterintuitive, to say the least, to suggest that past performance should be anything less than the primary factor in determining promotions. Research has consistently shown that past performance is far and away the best predictor of performance at higher levels of responsibility. But, ironically, past performance rarely plays a significant role in promotion within civil service systems. This is one of core flaws of civil service systems—and, perhaps, one of the reasons for the high number of “provisional” appointments to promotive positions. Failure to consider performance in promotion has the perverse effect of rewarding those who do well on tests at the expense of those who have proven themselves highly capable and effective in an actual work setting. Work performance and test-taking skills are not always at odds by any means. However, linking career advancement to performance is essential both as a means of motivating employees and as a means of assuring that the people most likely to succeed are promoted. Establishing a means of using performance evaluations in promotion decisions within the context of a civil service system is challenging for many reasons. First, it requires an objective, trusted evaluation system—which the City presently lacks. Second, a means must be devised to compare existing employees with outside applicants. Thus, for example, the number of points awarded to inside employees could be adjusted based upon performance. While we have no doubt that establishing these systems will be very difficult, and pose legal and practical challenges, it is absolutely essential in order for the efforts of the City’s employees be recognized. l. It is not enough to believe in government’s goals; we must also provide it with the tools to deliver public services effectively. San Francisco’s human resources systems will never reach a point where “reform” is no longer necessary. City government, like any organization, must continuously evolve over time, responding to changes in the world around it while retaining those elements that have shown through experience to be valuable. The human resources function is an important element in this evolution.